Music is ubiquitous in retail and commercial environments, with some managers believing that music can enhance the customer experience, increase footfall and sales and improve consumer satisfaction. Casino gambling is popular in the United Kingdom and anecdotal evidence suggests that music is often present. However, little is known about the rationale for music use from the perspective of casino managers. In this study semi-structured interviews were conducted with five casino managers to establish their motivations for utilising music, the factors informing their choice of music and the extent to which music is used with the intention of influencing gambling behaviour. Results showed that casino managers utilised two types of music—recorded background music, often sourced via external music supply companies and live music. Live music was often situated away from the gaming floor and used primarily to accompany participation in non-gambling activities. Recorded background music was not used with the direct aim of influencing customers’ gambling behaviour, but to create the right atmosphere for gambling and to promote certain moods within the casinos. To achieve these aims casino managers manipulated the tempo, volume and genre of the recorded background music. Casino managers also reported that some gamblers listen to music via portable music players, possibly with the intention of customising their gambling experience. 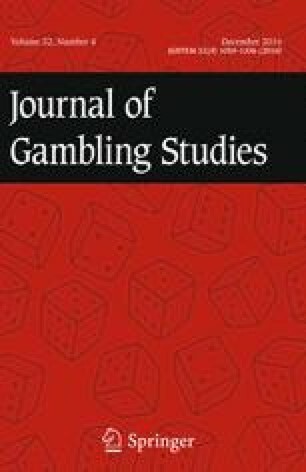 This study is unique as it has provided a first-hand account of casino managers’ implicit theories with regards to why they utilise music and the roles which music is considered to fulfil in casinos. Ethical approval for this project was given by The University of Sheffield. All procedures performed in studies involving human participants were in accordance with the ethical standards of the institution and/or national research committee and with the 1964 Helsinki declaration and its later amendments or comparable ethical standards. Business Pundit. (2011). 10 most sinister ways casinos keep you gambling. Retrieved March 15, 2013, from http://www.businesspundit.com/10-most-sinister-ways-casinos-keep-you-gambling/. Committee of Advertising Practice. (2014). Gambling. Retrieved June 23, 2014, from http://www.cap.org.uk/Advertising-Codes/Non-broadcast-HTML/Section-16-Gambling.aspx#.U6gbk5RdWpg. Gambling Commission. (2011). Industry Statistics 2009/10: Update covering 1 October 2009 to 30 September 2010. Retrieved October 3, 2011, from http://www.gamblingcommission.gov.uk/pdf/gambling%20industry%20statistics%202009%202010%20update%20-%20july%202011.pdf. Gambling Commission. (2015a). Industry Statistics: April 2010–September 2014. Retrieved August 13, 2015, from http://www.gamblingcommission.gov.uk/docs/Industry-statistics-April-2010-to-September-2014.docx. Gambling Commission. (2015b). Gaming machines on casino premises. Retrieved February 23, 2016, from http://www.gamblingcommission.gov.uk/Gambling-sectors/Casinos/Operating-licence-holders/Key-information/Gaming-machines-on-casino-premises.aspx. Griffiths, M. & Parke, J. (2005). The psychology of music in gambling environments: An observational research note. Journal of Gambling Issue, 13. doi: 10.4309/jgi.2005.13.8. Husain, F., Wardle, H., Kenny, T., Balarajan, M. & Collins, D. (2013). Exploring machine player behaviour: A qualitative exploration. Retrieved September 22, 2015, from http://www.natcen.ac.uk/media/205544/exploring-machine-characteristics-report-final-2-.pdf.